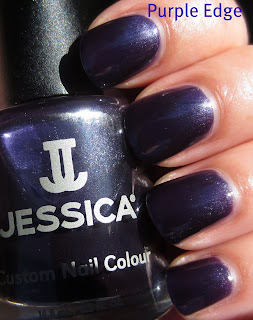 Today I have swatches from the Jessica Cosmetics Fall 2011 Rebel Glam Collection. This six piece collection contains a vampy jelly creme, a couple of purple/plum hues, a deep green shimmer, and two brown tones that are grungy and murky. Grungy and murky don't sound like very nice descriptive words, but when they're used to describe nail polish, I'm not at all turned off by those words! Especially because both of these brown cremes have hidden shimmer. All photos were taken outdoors in full sun and I used two coats. I'll talk more about the formula after the photos. Take a look! Showstopper is a bronzey creme with slight olive undertones and pale blue/green hidden shimmer. This is a color that may not appeal to everyone, but I am rather intrigued not only with the unique shade, but with the shimmer as well. 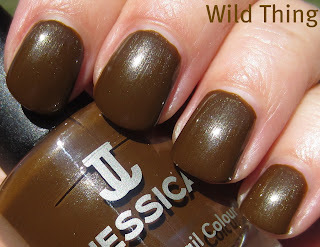 The other brown shade in this collection, Wild Thing, is very similar. It too has the hidden shimmer, but the color is more of a muddy medium brown. 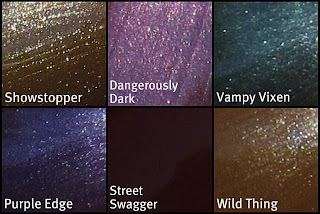 Dangerously Dark is a purple leaning toward plum shimmer shade. This shade has multi colored shimmer with a lighter violet shade being the predominant one. Vampy Vixen has the same type of shimmer finish that Dangerously Dark does. The shimmer in this deep viridian green shade is a pale aqua. 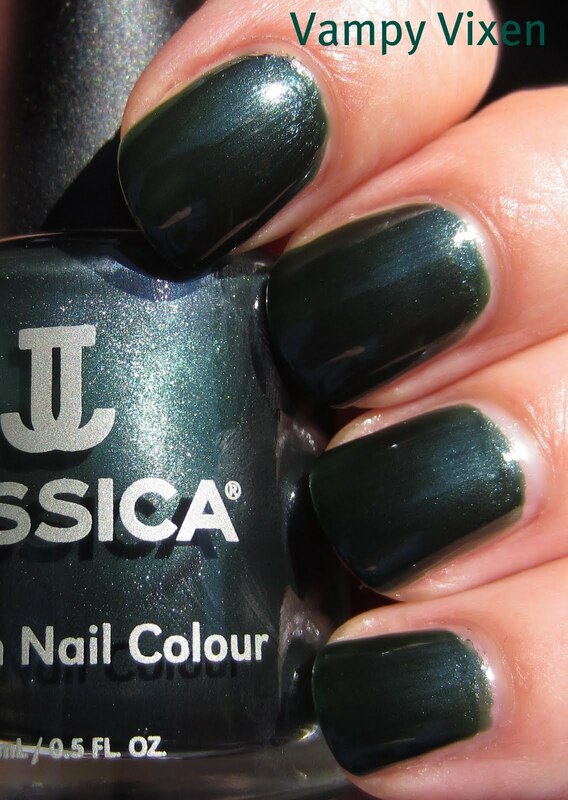 I love this rich green jewel tone, especially in the Fall. Purple Edge has an interesting formula that looked like it was going to be a sheer jelly creme finish during the first coat. This purple shade is the color of grape juice and it has a sparse amount of silver shimmer that I didn't notice after the first coat, although I did see it in the bottle. If you enlarge the picture and look at the area near my cuticles, you can see how sheer the first coat was. Amazingly though, the second coat adds plenty of pigmentation for a finished look. 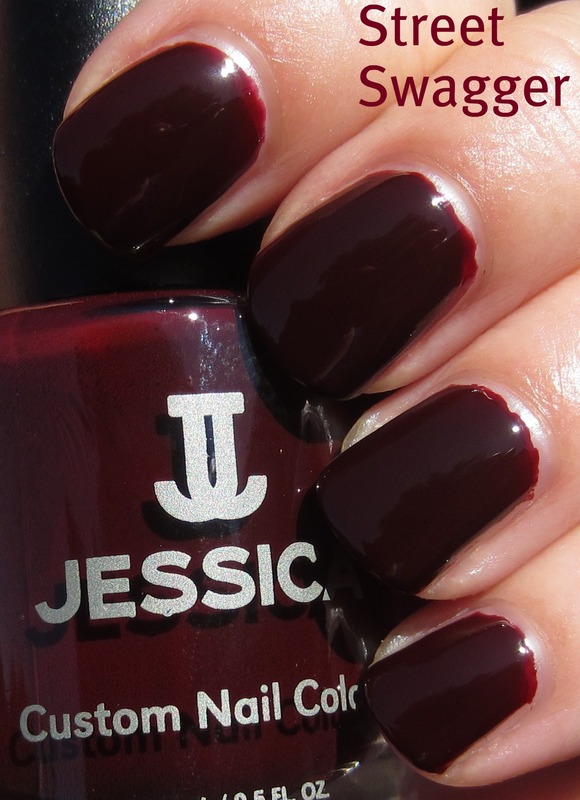 Street Swagger is a perfect vampy deep wine colored cream with a jelly finish. This reminds me of one of my all-time favorite discontinued China Glaze shades, Dripping Wet. The nice thing about Street Swagger though, is that I only needed two coats for an opaque look, whereas with Dripping Wet I normally need about four coats to achieve an opaque look. Blackened red. Love this one. Wild Thing is more brown than Showstopper, but I think these two shades are almost too similar to have them both in the same collection. This medium brown creme has basically the same type of pale blue/green hidden shimmer as Showstopper. I'm having a hard time describing this shade with words, because while it is a medium brown, I wouldn't call it straight up brown. A deep antique gold, mud brown, yellow toned drab brown...I'm open to suggestions! Macro shots show the shimmer colors. Note that I cropped the areas on my nails where the light was hitting them so you can see the shimmer colors better, but that makes the base colors appear lighter. I'm a big fan of Jessica nail polish, and I think their formula is right up there with the best of them. They have high pigmentation, the formula is smooth and easy to work with, and they flow evenly during the application. Generally, two coats is all you need from this brand for a completely opaque finish. I'm pleased with all of the colors in this collection, and the range of colors definitely gives me a Fall vibe. 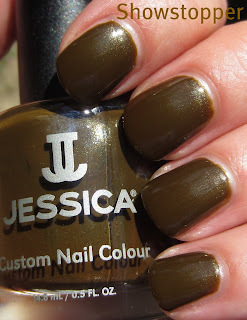 Jessica polishes retail for $7.50 on their web site here. Check out this super cute Halloween Collection they have here too! Haha! The Halloween bottles are cute! My favorite is probably Street Swagger! Lovely photos and commentary, thanks for sharing them! My favorite is Vampy Vixen! Great swatches! You rock for posting these! I've been looking all over the place for swatches of the collection, thank you! Showstopper and Vampy Vixen appeal the most to me. The shades leave me sort of underwhelmed for some reason. Might just be my mood and still clinging to some brighter days/shades still. Glad to know this is brand has a good formula however. Showstopper and Wild Thing are two of my favorites. Muddy sounds just perfect to me!